It’s called a QR code. QR stands for “quick response”, which isn’t actually too helpful in explaining anything. It’s really just a code meant to be read by a smart phone that will send you directly to a website (among other things). They can hold a whole lot more information than a simple barcode, and are said to be accurately readable even if 30% of the code is obscured. So what does that mean for you? If you have a smart phone, presumably with a camera, and you have a data plan, all you need to do is install a free QR code-reading app, and you’re ready to go. Just find a handy QR code, open your app, and center the code in the viewfinder square on your phone display. You’ll probably see some little blinking dots reading the code, and then it will jump to a display with the website’s URL. Tap it, and there you are! The one above goes to my Delicious bookmarks. You may or may not be interested in them, but I figured it was a safe place to send you. Of course, it’s ideal if the target website is mobile-friendly! QR codes can also send a text message or email message, share a phone number, open a map, display some text, and any number of other little tasks. How about this one? Love this juxtaposition of old and new technology! This one goes to my LibraryThing catalog. Obviously, I made my own QR codes here. It’s ridiculously easy. 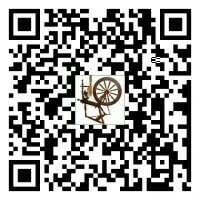 Just go to a QR code generator like QRstuff or BeQRious and choose the kind of code you want to create. Click the button and your custom code will be ready to download! You can save it as-is, or open it in photo editing software. The next big decision is what you’re going to put it on… some people have even knitted readable QR codes! Seriously, though, what could this possibly have to do with knitting or fiber? Well, I’m just waiting to see QR codes on yarn ball bands – instead of wondering if a yarn I have in my hand is available in other colors, how about scanning its QR code and going straight to the manufacturer’s web page for that yarn? I could SEE any other colors, and decide about special ordering something my LYS didn’t carry – even if they didn’t happen to have a color card for that yarn! Or maybe next time you give a knitted gift, you could attach a tag with a QR code for the care instructions… or maybe a personal message for the recipient. Like knitting, the possibilities are endless – so go explore! if only i were as smart as my phone, i would do this. i still need to take the class that will intro me to all of the features of my droid.